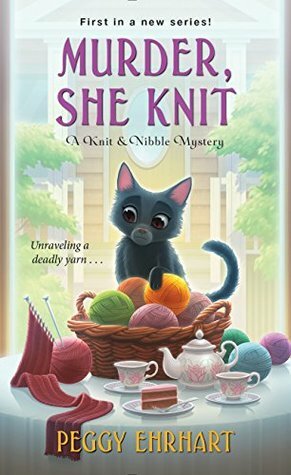 Murder, She Knit by Peggy Ehrhart is the first book in the new cozy A Knit & Nibble Mystery series. A cute cozy series that features a bit older of a main character, some crafty projects and a cute little kitty that slowly adopts her new human. With her daughter gone off to college now Pamela Paterson has filled some of her free time with her knitting group, Knit and Nibble. The group alternates homes of it’s members to get together to craft and share some snacks once a week and it was now Pamela’s turn to host the meeting. Just before the night’s meeting though Pamela runs into an old acquaintance and invites her to join the knitters. At the time others begin to arrive though Pamela gets busy and doesn’t notice her new guest had never arrived. After the party breaks up however Pamela goes out to check on the stray kitty she’d been feeding only to find Amy with a knitting needle protruding from her body and most obviously dead. As with any cozy read our main character here can’t possibly sit back and let the police handle the investigation thinking they just don’t ask the right questions. So with the help of her best friend and fellow knitter, Bettina, Pamela sets out to find just what had happened to bring about a murder in her own garden. I have to admit this one had an instant endearing quality to it as it immediately brings back memories of my own grandma who was good at all the crafty things that I just never grasped, knitting, crocheting, sewing and on and on. As nice as the story went though I would still like a tad more quirkiness, perhaps giving Catrina (the kitty) a bigger role and to go deeper into getting to know the characters in the future installments. The author gave a lot of knitting things a lot of depth so a bit of that focus into other aspects would be nice too. Otherwise a nice start leaving me to rate this one at 3.5 stars. Peggy Ehrhart is a former English professor who lives in Leonia, New Jersey, where she writes mysteries and plays blues guitar. 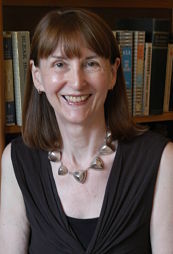 She holds a Ph.D. in medieval literature from the University of Illinois and taught writing and literature at Queens College, CUNY, and Fairleigh Dickinson University, where she was a tenured full professor. Her short stories have appeared in Futures Mystery Anthology Magazine, Crime and Suspense, Flashing in the Gutters, Spinetingler, Crime Scene: New Jersey 2, and Murder New York Style. A longtime member of Mystery Writers of America and Sisters in Crime, Peggy served on the board of MWA New York as head of the Mentor Committee. She was president of Sisters in Crime NY/TriState from 2013 to 2015. Peggy regularly attends mystery‑writing conferences and participates in conference panels and also gives talks on mystery fiction at libraries in New York, Connecticut, and New Jersey. Great Review, Carrie! That cover is just too cute!